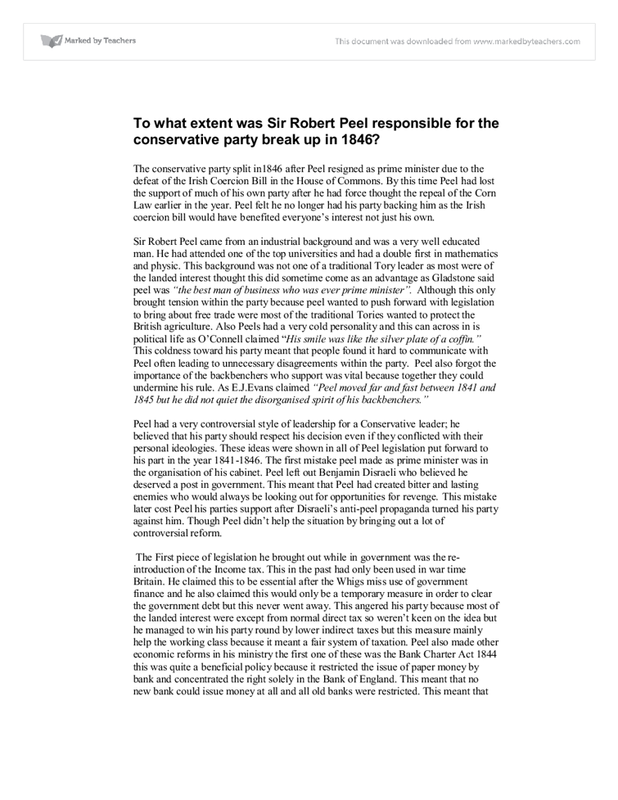 To what extent was Sir Robert Peel responsible for the conservative party break up in 1846? The conservative party split in1846 after Peel resigned as prime minister due to the defeat of the Irish Coercion Bill in the House of Commons. By this time Peel had lost the support of much of his own party after he had force thought the repeal of the Corn Law earlier in the year. Peel felt he no longer had his party backing him as the Irish coercion bill would have benefited everyone’s interest not just his own. Peel had a very controversial style of leadership for a Conservative leader; he believed that his party should respect his decision even if they conflicted with their personal ideologies. These ideas were shown in all of Peel legislation put forward to his part in the year 1841-1846. The first mistake peel made as prime minister was in the organisation of his cabinet. Peel left out Benjamin Disraeli who believed he deserved a post in government. This meant that Peel had created bitter and lasting enemies who would always be looking out for opportunities for revenge. This mistake later cost Peel his parties support after Disraeli’s anti-peel propaganda turned his party against him. Though Peel didn’t help the situation by bringing out a lot of controversial reform. The First piece of legislation he brought out while in government was the re-introduction of the Income tax. This in the past had only been used in war time Britain. He claimed this to be essential after the Whigs miss use of government finance and he also claimed this would only be a temporary measure in order to clear the government debt but this never went away. This angered his party because most of the landed interest were except from normal direct tax so weren’t keen on the idea but he managed to win his party round by lower indirect taxes but this measure mainly help the working class because it meant a fair system of taxation. Peel also made other economic reforms in his ministry the first one of these was the Bank Charter Act 1844 this was quite a beneficial policy because it restricted the issue of paper money by bank and concentrated the right solely in the Bank of England. This meant that no new bank could issue money at all and all old banks were restricted. This meant that the economy wouldn’t be over run with paper money and deprecation would occur. The main economic policy that damaged his reputation within the party was the move towards free trade. Many of the conservative peers wanted to protect the British agriculture and industry and the idea of free trade scared them so when Peel abolished nearly al the duties of foreign product his party were outrage and some claim that all Peel had left to do was repeal the Corn Laws. Thought the economy was Peel main priority during his time in office Peel main concern was the defence of the country it colonies. Peel put a lot of time and money into foreign policy. He believe that he must maintain the status quo in order to keep his part interest secured and to do this a strong law and order system needed top be maintained and secured. He maintain a navy of 29,000 and a standing army of 90,000 troops this was criticized many time because many Conservative and Whigs alike want spenditure on foreign policy as low as that of the 1930’s. His other priority was the maintenance of law and order. There were two major groups that wanted reform at the time, the chartist and the anti-corn law league. Chartism began to rise again in the summer of 1841 once O’Connell was released from jail. Paul Adelman shared the view that Peel ignores all of the demand as he believed “Chartism was not a political but a public order problem”. This ignorance of this repeated attempt of reform stopped Chartism in its tracks. Peel government saw a lot of revolt and riot such as them demonstrated by the Chartist and some conservative had fear a revolution like this seen 1815 when they had the spectre of the French revolution hanging over there heads. Peel believe giving into there group was not the option and instead tried to maintain a strong police force and when the riot became to extreme he even sent on troops to quell the violence. Thought it cannot be said he did nothing to help the masses Peel did bring about some of social reform despite his parties disagreements. He did introduce a few social reforms such as the Mines Act of 1842 but most of these seem haft hearted and unaffected. The Mines act 1942 is often seen to lack certain clauses as it still allow boys from 10-16 to work in the Pitts. Thought this bill didn’t face much opposition in the House of Commons Peel didn’t really fight Wellington and Wharncliffe when they change the age of exclusion from 13 to 10 years old. This yet again show his lack of support to his own party as he once again join force with the industrialist rather than being as statesman that he is often proclaimed to be. The Factory Act (1844) highlighted some of the poorest administration ever seen in Peel time as Prime Minister. The Factory Act didn’t get of to a good start within the conservative party this was because Graham managed to upset nearly everyone when he started investigation the factory question in 1833. He presented a bill which “combined the nitro of factory reform with the glycerine of the education issue in one explosive package” (Donajgrodzki). When Graham altered the bill in order to please the Anglican Church he managed to upset the Dissenters. The Dissenters responded to this with a nationwide campaign against the bill and forced Graham to abandon the attempt. This ended a bad year for Peel but to increases the general distrust and unpopularity of Graham even within his own party. Ashley said “He was the most dishonest of all public officers.” So when the bill finally became legislation in June 1844, with a twelve hour clause women and young adult plus half days for children, it had total undermined Peel leadership and with fresh opposition Ashley saw his relations within his own party even more diminished. Peel made a lot of changes to Ireland during his Ministry and one of the most controversial of these was the introduction of the Maynooth College Bill. The Maynooth College was founded in 1795 and was used as a school to train Catholic priests. The college had always received a government grant of £9,250p/a. This remained the figure until the 1840’s thought it was apparent that this was now insufficient in maintaining the college but no government wanted to increase the grant in case it caused offence to the Church of England. Thought in 1843 Peel thought it time to address this problem and considered an increase in the colleges’ budget. He argued “all combined to send forth priesthood embittered rather than conciliated by the aid granted by the state for their education, and connected…with the lower classes of society” when he introduced the idea to his cabinet all were in favour except than Gladstone and Goulburn and eventually Gladstone resigned over the matter. As Graham pointed out to peel “I foresee that on the part of the British public in their present temper, invisible repugnance will be felt to any such proposal” as itis clear that due to government opinion Peel had embarked on a difficult mission. He proposed an increase in the grant to £26,000 to the common in 1845. He found himself face with a coalition of opposition consisting of, Tories, low-church Anglicans, Orangemen, dissenters and radicals. Peel found himself opposed in all section of his party and the House of Lords thought he remained determined to succeed. In the end the Maynooth bill passed in the spring of 1845 but only because Peel had support from the Irish and the Whigs. From the conservative point of view Peel had acted more determined and had been more stubborn about the Maynooth crisis than he had been on the Sugar Duties act and the factory act. Peel did play a larger part in the break up because from his first day in office he managed to upset people with his attitude and ideology of have the government should be run. Peel believed that his party should trust his judgment and should back him on all legislation and this work in the initial period because the conservative hadn’t been in power for nearly a decade and didn’t want the newfound power to be taken from them by Peel resigning. So every bit of legislation peel put to Parliament was supported by his party. Until it came to 1846 were by this time he had push the party to far and they no longer backed him. Thought the anti-peel propaganda of people such as Disraeli and Lord George Bentin didn’t not help as peel tried to push thought such a controversial bit of legislation such as the Repeal of the Corn Laws. It cannot be denied that Peel played a part in split the conservative party in 1846 thought it could be argued that he did this in the interest of the people. As Gash says “for him the repeal of the Corn Laws, has the Reform Act had been for Grey, was essentially a persevering measure”. Gash believed Peel created a new Conservative party out of the ruin of the Tory only to sacrifice it because the countries interest demanded it. Gash argued it was not him that failed and broke up the party it was his failure to educate and discipline his party that brought him down and that he risked everything by expecting them to ignore there own principle and self interest and support his ideas. As Peel claim in his resignation speech “I have thought it constant with true conservative policy to promote so much of happiness among the people that the voice of disaffection should no longer be heard.” This means that all his political measures were for the benefit of the people and not for his personal gain or personal interest. Gash often claims that it was the lack of party loyally that split the conservative party in 1846 not that of peels himself. Thought many historians agree with this view some tend to believe that of Disraeli. Disraeli argue that “the first duty of an English Prime Minister is to be faithful to his party” and that “good and honourable government is not only consistent with that tie but in reality manly depend on its sacred observant.” He claims that Peel ignores his party and by this he was trying to sustain a democracy without a stable party system a task witch is almost impossible. Disraeli claim by these actions Peel risked doing more damaged to the country by upsetting the delicately balance political system than he could have done well by repealing the Corn Laws. So it was solely due to the action of Sir Robert Peel in the latter years of his ministry that brought about the conservative party break up in the year of 1846. Wood agrees that is was fact that Peel did break up the conservative party but he believe that Peel was a general statesman that had put the views of the community before that of his own party but Peel main problem was that he only listen to his own conscience and ignore others. He claims the result was bad for both Peel and Disraeli because Peel ended his political career while Disraeli was to become the head of party that was split in two. In conclusion it is hard not to place most of the blame of the conservative party break up on Sir Robert Peel himself. As his string of anti-Conservative measure and politics placed a great strain upon the consciences of many Tory Members of parliament. His controversial characteristic that made him classed with most of his cabernet on many occasions put a heavy strain on the party morale and often lead to resignation from key ministers. However it cannot be said that all of the blame lies with him. The anti Peel propaganda spread by Disraeli thought Peel ministry managed to ease the party away from Peel way of thinking and cause and unnecessary tension between the party and its leader. Also we could say that the forcing thought of some of these controversial acts was not down to peel alone. Pressure from the masses thought organisation such as the chartist and the anti Corn Laws league place enormous amount of pressure of Peel to bring about reform. Another pressure was the Irish potato faming that left thousands of Irish citizen on the brink of starvation that help push the Repeal of the Corn Laws thought as people could afford the bread. Thought some would Claim Peel used this Potato faming as an excuse to push the repeal thought Parliament. It defiantly can’t be denied most of the blame does resultantly lie with Peel rather than these other factors. How far were Gandhi's actions after 1920 responsible for Indiagaining her independence in 1947? To what extent can the Tory party be responsible for its collapse in 1830? 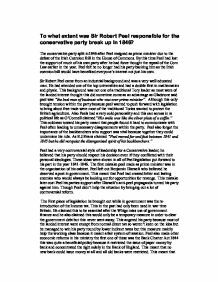 How fair is it to Say that Peel betrayed his Party? This would have been attractive to Peel, as better European relations would have reduced the chance of any unnecessary and costly war. The Chartists wanted a more widespread parliamentary reform. This is different to the ACLL, who were focused on one issue. As we mentioned before, the reduction in lead time would meet the customers' requirements. The customers need not waste time on waiting for long of our goods, they can receive the finished dolls and sell it as soon as possible. At the historic meeting of the Irish Parliamentary Party at the House of Commons on 1 December 1890, the party split: 45 MPs repudiated Parnell's leadership, 37 supported him. A few days later the leaders of the Irish Catholic clergy called upon the Irish people to repudiate him. This combined with the possibility of civil war in Ireland made Peel feel that his only option was to grant Catholic Emancipation. Peel had a firm belief that he should put the needs of the nation above those of his own Party. It would be unfair to see these revolutions as having achieved nothing, for they bred a new more moderate kind of conservatism that acted as a 'coalition of propertied interests'5and created the Piedmontese constitution that would survive to govern all Italy by 1871. This created massive political conflict within the Tory party. And resulted in a massive split. Some of the Tory members joined the Whigs the party, which was seeming to see more controlled and liberal. Whereas as the Ultra Tories dropped out due to great disagreement. By 1830 the Tory party was very weak and it had a new strong opponent- The Whigs. rents and interest rates in the wake of the worldwide Depression rather than home rule. The 1935 Government of India Act,22 seen by Spears as a "blueprint for independence" was criticised in India for not going far enough; Gandhi commented, "India is still a prison, but the superintendent allows the prisoners to elect the officers who run the jail."